Name Variation Mary Ann Kearney was also known as Kerney. Married Name 22 November 1892 As of 22 November 1892,her married name was Kaufman. Married Name 22 November 1892 As of 22 November 1892,her married name was Kaufmann. Mary Ann Kearney was born in June 1862 at Iowa also reported as 1860. She was the daughter of (?) Kearney. Mary Ann Kearney married Alphonse Emil Kaufmann on 22 November 1892. Mary Ann Kearney died on 6 October 1903 at age 41. Mary Ann Kearney had 3 with 3 living in 1900 children. Alphonse Kaufmann Jr. was the son of Alphonse Emil Kaufmann and Mary Ann Kearney. Alphonse Kaufmann Jr. died on 13 March 1980. Married Name 30 August 1927 As of 30 August 1927,her married name was Kaufman. Mary Lackey was born circa 1895 at Wisconsin. She married Leo Andrew Kaufman, son of Alphonse Emil Kaufmann and Mary Ann Kearney, on 30 August 1927 at Dubuque, Iowa. Name Variation Andrew P. Swartz Jr. was also known as Andy P.
Andrew P. Swartz Jr. was born on 27 June 1919. He married Betty Jane Rupp, daughter of George Henry Rupp and Etta Lillian McPherson, circa 1942 Betty Jane Rupp and Andrew P Swartz engagement announcement. Andrew P. Swartz Jr. died on 7 September 1973 at age 54. He was buried after 7 September 1973 at Mount Calvary Cemetery, Dubuque, Dubuque, Iowa. (?) Ross married Elizabeth Ann Chambers, daughter of Harrison W. Chambers and Gladys Belle Nickey. Married Name 5 September 1928 As of 5 September 1928,her married name was Nickey. Jennie Maye Langston was born circa 1901 at Arkansas. She was the daughter of William Bevan Langston. Jennie Maye Langston married Laurence Noyes Nickey Sr., son of Abraham Lincoln Nickey and Mary Louise Noyes, on 5 September 1928 double wedding with her sister; Engagement announcement for Jennie Maye Langston to Laurance Noyes Nickey and Frances Willma Langston to Louis Clifford Merrill 15 Aug 1928 El Paso Herald, (El Paso, TX). Jennie Maye Langston died on 24 November 1961 at El Paso, Texas. [S250] U.S. Federal Census 1930 U.S. Federal Census, by Ancestry.com, Year: 1930; Census Place: Big Lake, Reagan, Texas; Roll: 2385; Page: 4B; Enumeration District: 0002; Image: 385.0; FHL microfilm: 2342119. [S373] U.S. Federal Census 1940 U.S. Federal Census, by Ancestry.com, Year: 1940; Census Place: El Paso, El Paso, Texas; Roll: T627_4181; Page: 7B; Enumeration District: 256-9. Married Name 10 December 1955 As of 10 December 1955,her married name was Nickey. Married Name 4 February 1982 As of 4 February 1982,her married name was Arnold. Enolie Ann Collins was born on 22 October 1935 at Texas. She married Jimmie L. Arnold on 4 February 1982 at El Paso, Texas. Enolie Ann Collins died on 15 October 2004 at age 68. Enolie Ann Collins had 4 children from this marriage children. Jimmie L. Arnold was born circa 1933. He married Enolie Ann Collins on 4 February 1982 at El Paso, Texas. Paul Eugene Clear was born on 20 October 1925 at Grover Hill, Ohio. He was the son of Mark H. Clear and Ella G. Nickey. Paul Eugene Clear died on 28 January 1983 at Escambia, Florida, at age 57. Married Name Her married name was Hayes. Unknown (?) married (?) Hayes. Harry Hayes was the son of (?) Hayes and unknown (?). Harry Hayes died after 1930. Ruel Hayes was the son of (?) Hayes and unknown (?). Ruel Hayes died after 1930. C. Hayes was the son of (?) Hayes and unknown (?). C. Hayes died after 1930. T. Hayes was the son of (?) Hayes and unknown (?). T. Hayes died after 1930. Charles Hayes was the son of (?) Hayes and unknown (?). Charles Hayes died after 1930. Married Name Her married name was Wenings. Bess Hayes was the daughter of (?) Hayes and unknown (?). Bess Hayes married (?) Wenings. Bess Hayes died after 1930. (?) Wenings married Bess Hayes, daughter of (?) Hayes and unknown (?). Married Name 25 February 1950 As of 25 February 1950,her married name was Nickey. Arlene Gulker was born on 19 March 1915. She was the daughter of William H. Gulker and Elizabeth (?). Arlene Gulker married Abraham H. Nickey, son of John Lawrence Nickey and Mary Martha Hayes, on 25 February 1950 Arlene Gulker and Abraham Nickey marriage announcement. Arlene Gulker died on 24 May 1999 at age 84. Donald Orbin Nickey was born on 5 April 1951 at Bradenton, Florida. He was the son of Abraham H. Nickey and Arlene Gulker. Donald Orbin Nickey died on 13 June 2008 at age 57. Name Variation Fhlona C. (?) was also known as Flona (?). Married Name before 1940 As of before 1940,her married name was Nickey. Married Name before 1986 As of before 1986,her married name was Colpaert. Fhlona C. (?) was born on 16 November 1905 at Illinois. She married Abraham H. Nickey, son of John Lawrence Nickey and Mary Martha Hayes, before 1940. Fhlona C. (?) and Abraham H. Nickey were divorced before 1950. Fhlona C. (?) married (?) Colpaert before 1986. Fhlona C. (?) died in February 1986 at Ohio at age 80. [S373] U.S. Federal Census 1940 U.S. Federal Census, by Ancestry.com, Year: 1940; Census Place: Bowling Green, Wood, Ohio; Roll: T627_3170; Page: 1A; Enumeration District: 87-11. (?) Colpaert married Fhlona C. (?) before 1986. Married Name before 1938 As of before 1938,her married name was Nickey. Ina Jane Rahm was born on 25 July 1917 at Toledo, Ohio. 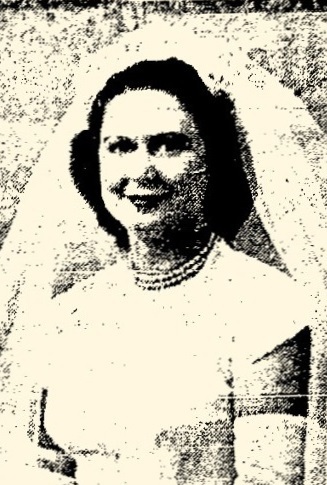 She married Edward H. Nickey, son of John Lawrence Nickey and Mary Martha Hayes, before 1938. Ina Jane Rahm died on 16 December 2006 at age 89. Married Name Her married name was VanRynen. Eileen Mae Wood married (?) VanRynen. Eileen Mae Wood was born on 5 November 1932 at Toledo, Lucas, Ohio. She was the daughter of Leo C. Wood and Mary E. Nickey. Eileen Mae Wood died in February 1983 at age 50. (?) VanRynen married Eileen Mae Wood, daughter of Leo C. Wood and Mary E. Nickey. Isaac Taylor was born on 1 August 1666. Isaac Taylor married Sarah Broadwell in 1689. Isaac Taylor died in 1717. Isaac Taylor immigrated with Mary Hayes on 29 September 1683 at ship "Endeavor" from England to, Pennsylvania; Robert Taylor had arrived a year earlier. 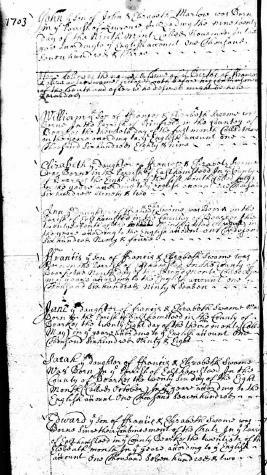 On 20 August 1689 at Records for the Courts, Chester, Pennsylvania, "Robert Taylor past over 2 deeds to his Sonns Isacke and Josiah Taylor both dated ye 20 day of ye 6th month (August) 1689, viz. one to Isacke for a Plantation and premisses and Conteining 300 acres of land lying in Springtowne another to Josiah for a Plantation and p'misses lying in Marple." Married Name 1689 As of 1689,her married name was Taylor. Sarah Broadwell married Isaac Taylor, son of Robert Taylor and Mary Hayes, in 1689. Sarah Broadwell died in 1748. Ann Swayne was born on 27 June 1694 at East Hampstead, Berkeshire, England. She was the daughter of Francis Swayne and Elizabeth Milton. Ann Swayne died in 1705 at England. She was buried on 8 December 1705 at Reading, England. William Swayne Jr. was born on 11 June 1721 at Pennsylvania. He was the son of William Swayne and Elizabeth Dell. William Swayne Jr. married Ann Pusey in 1743. William Swayne Jr. was the executor of Elizabeth Milton's estate on 3 March 1743 at Chester, Pennsylvania; Probate of Elizabeth Swayne - executors William and Edward Swayne. William Swayne Jr. died in 1785. 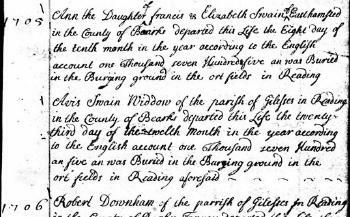 In Edward Swayne's will dated 16 June 1775 at East Marlborough, Chester, Pennsylvania, William Swayne Jr. was named as executor; SWAYNE, EDWARD. East Marlborough. June 16, 1775. May 11, 1776. To wife Sarah plantation whereon I now dwell during life and at her decease to be sold, also all household goods. To son Edward 5 shillings. To son Jonathan £20. To daughters Jane Calvert and Hannah Yarnall 5 shillings each. To son Jesse £45. To daughter Sarah England £5. To son Robert £45. To daughter Elizabeth Ailes £25. To daughter Martha Swayne £30. Remainder to 3 daughters Sarah, Elizabeth and Martha. Executor: Friend William Swayne.